October | 2016 | Love Those "Hands at Home"
The process or the product? The doing or the done? Have you considered where you get the satisfaction in your making? Whether you bake or garden or write or craft in some fashion, do you do it because you love the doing or is it the finished product that thrills you? I’ve come to realize that I’m process-oriented, perhaps to an unusual degree. I love the doing and seem to care little for the done. When I recently wrote about finishing the marathon yoyo coverlet, many readers asked what I was going to do with it. I was stumped. The absolute truth is probably nothing much. Part of that is purely practical—the texture of the coverlet would make it a magnet for my cats. But it is also true is that I’ve already sort of lost interest in the coverlet. It was interesting as something to do, to make, to immerse myself in, but now it’s just another quilt in the house. Even my all-time favorite quilt, the 1812 cot-to-coffin quilt, is simply folded up now and stored in an armoire. The wool throw I wove? It’s in the cedar chest. The silver jewelry I’ve crafted? Tarnishing in the jewelry box. The bottom line is that it’s the process of making that engages me, challenges me, makes me feel alive. The products sort of seem like just more things in the house–pretty things, but things nonetheless. It’s the interacting with the materials, the touch, the skill, the focus, that I love. The yoyo coverlet will get dragged out for the biennial show of my quilters’ guild, because I like warm fuzzies as well as the next person, but it will probably live in a cupboard or cedar chest until then. I think this is also what leads to the Etsy shops I have. I love the process of making chocolates but don’t want to, and shouldn’t, eat all of what I make. What to do? Give some away and sell the rest. 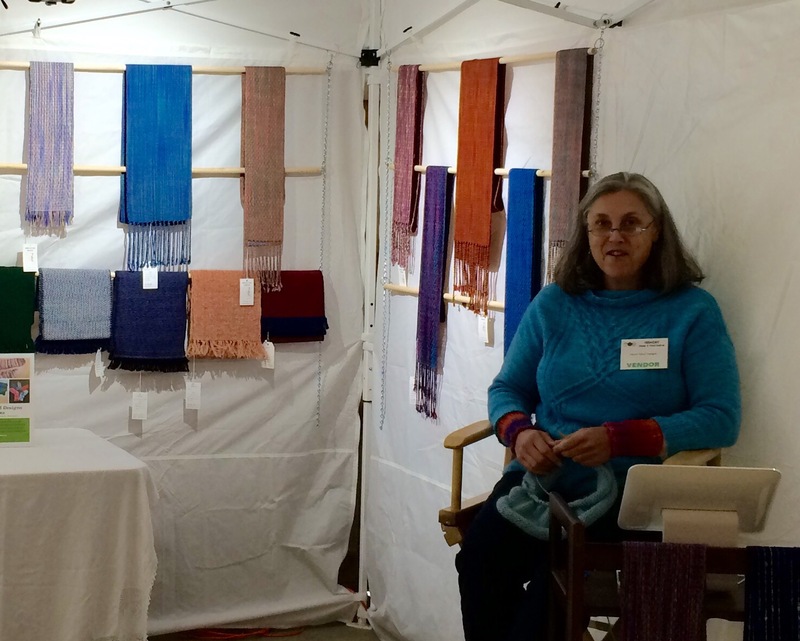 I love weaving but one person can use only so many kitchen towels and scarves. But I feel driven to weave—I love the process. What to do? Give some away and sell the rest. So, in support of the idea of giving some away and to celebrate the opening of, and the first couple of sales in, the newest Etsy shop, Woven Together, I’m going to have a random drawing for a handwoven kitchen towel. So far the towel looks like this. The winner of the drawing will be asked to tell me what colors s/he would like to see added to the towel and, when all the pieces on the warp are complete, I’ll send the towel to the winner! It might be a few weeks before it’s finished . . . because I’ll be enjoying the process. Anyone can enter, from any part of the world. To enter the drawing, I ask you to tell us, in the comments, whether you are process-oriented or product-oriented—what motivates your making/doing? Try not to just say “both” . . . .
And, if you’re inclined, visit Woven Together, and give me some feedback about what you’d like to see more of in the shop. This latter is optional, though! The deadline will be midnight on Tuesday, November 8. As our Election Day, that’s a very important day here in the US. I will be voting, to enjoy the process and also, I am hopeful, the product of that particular action! And now here is the host of Jeopardy!, Alex Trebek! Alex: Thank you, ladies and gentlemen. Hello and welcome to Jeopardy!, America’s favorite answer-and-question game. Yes, we give the answers, and then it’s up to these three contestants to come up with the questions. Alex: Let’s begin. Please remember to phrase your responses in the form of a question. Contestant: I’ll take Yoyo Coverlets for $100, Alex. Contestant: Yoyo Coverlets for $200, Alex. Contestant: Let’s try Yoyo Coverlets for $300. Contestant: Yoyo Coverlets for $400, please. Alex: That’s correct. We have a minute to go. And now the last clue . . .
Alex: Good. And now it’s time for Final Jeopardy! Alex: The category is still Yoyo Coverlets! Players, I’ll give you the clue, and you will then have 30 seconds to write down your response. Be sure to phrase it in the form of a question. You have 30 seconds, players. Good luck. Alex: Yes! Contestants, you all did very well, very well, indeed. But, our winner isn’t even here today. Our winner is Kerry Sanger! She wins for finishing the Yoyo Coverlet! Alex: We’ll see all of you next time on Jeopardy! So long, everybody! Every spring, I desire revenge. Spring comes to the entire rest of the northern hemisphere before it gets to us, you see. For months, from February on, I look at your photos of snowdrops, of crocus, of hellebores and daffodils. I see tiny buds sprouting on your trees and read your descriptions of warm, sweet-smelling breezes. All while my world and any promise of spring are still covered in drifts of snow. I get a little bitter, looking at your spring. And, by the time spring arrives to me and my snowdrops and daffodils show their pretty faces, people are tired of looking at snowdrops and daffodils and have moved on from the rapture of spring. It’s not just me—Facebook users and bloggers all over the Northeast know my pain. But, this is the time of year we get our revenge! Because we have autumn in the North Country of upstate New York, in the Adirondacks, and all over New England. We have glorious, perfect autumn here. It comes early and seems to last and last. We have apples. We have pumpkins. We have mountains and lakes and a sky that is Adirondack blue. Click on the thumbnail photos and drink it in! Or at least the sky is Adirondack blue when it isn’t some moody and evocative shade of autumn. We have oaks and poplars, and birches and beeches, and ash trees, and their leaves all turn fabulous colors. But, more important, we have maple trees. We have maples that turn flaming red and orange. They aren’t satisfied with giving us the gift of sap for maple syrup in the spring. Every fall, the maple trees up the ante on themselves, and they give us glory. This photo is not the most spectacular but it shows exactly what this part of the world looks like right now. All the ingredients—the colorful foothills of the Adirondacks, the remnants of corn that has been stored as ensilage for cows, the bright trees against an Adirondack blue sky, and the ladder reaching into an apple tree, providing access to that perfect autumn fruit. So, in the spring, when you are parading your colors and beauty, I’ll be enjoying them. But, I’ll also be sighing and waiting for mine, in October. Whew! We’re home again, mentally exhausted and physically sore, but full of ideas and enthusiasm for a craft we love. And you, too, can achieve all this! I have one purpose in writing—to encourage you to go away, to find an intensive learning experience in your favorite craft, whether it is cooking, knitting, writing, gardening, quilting . . . just go. Not a mellow retreat, not an afternoon crafting with friends, although those have their place. Find yourself an opportunity to spend a week, or more, undistracted by daily chores and obligations, to work really hard, with nothing more important than immersing yourself in something you love. Our week at Vavstuga Weaving School felt, at times, like boot camp. But, like boot camp, we came out stronger and more confident, and ready to move to a new level of weaving. The course we took was Nordic Classics and, because I know there are weavers reading, I’ll give an overview of what we learned. 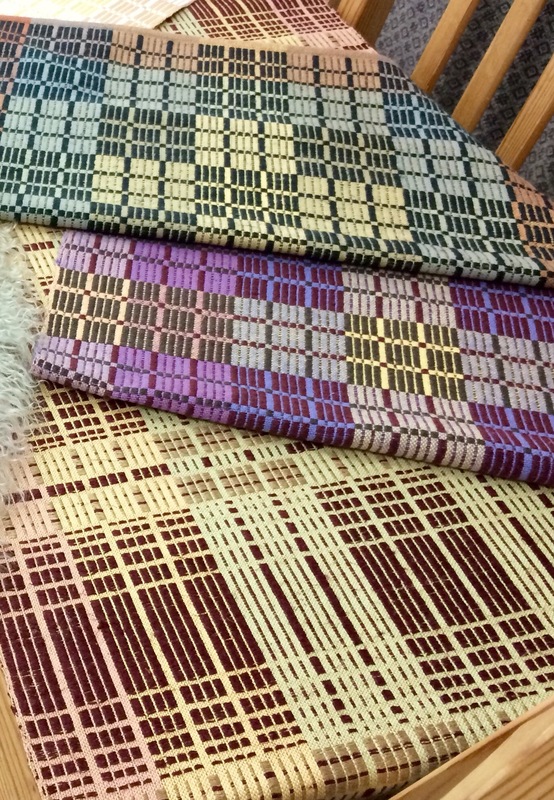 For non-weavers, feel free to skip the details and just look at the pretty pictures. But, as you look, also imagine what you could make, in your own chosen medium, if you gave yourself the chance. 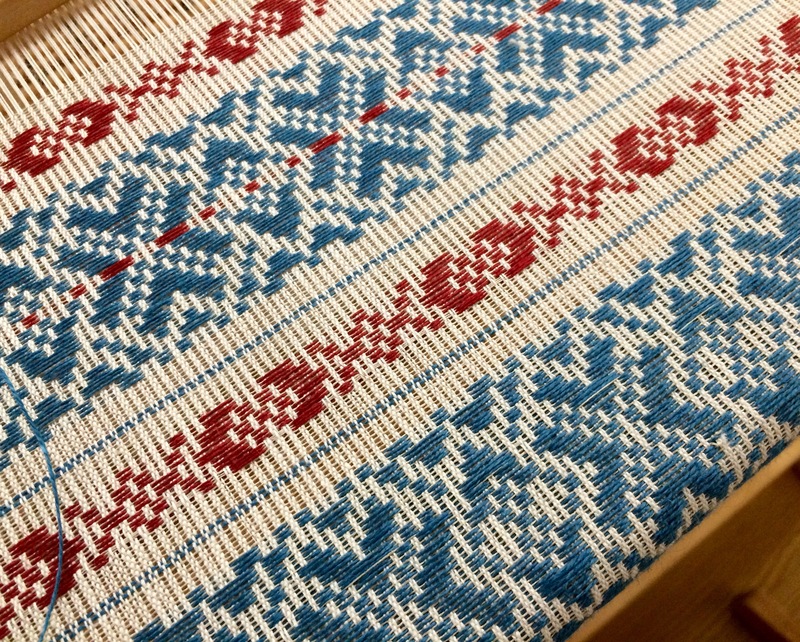 The Nordic Classics workshop focused on 6 weaving techniques associated with Sweden, Denmark, Finland, and Norway. We had taken only the Weaving Basics course before (I wrote about it!) and this was much more difficult weaving than that course, or any weaving we’d done on our own. Our classmates, the other 6 people in the workshop, were much more experienced weavers than we and I was a little unnerved at first. But, with skillful instruction and guidance, as well as encouragement from the others, we were able to do work we’re very proud of! We took on 6 different projects in what amounted to 3.5 days of actual weaving so we didn’t come home with finished projects. We have, in most cases, good-sized samples that can be turned into finished projects. This lace is made of fine linen thread. I was familiar with Leno, from working with vintage linens, but most lace like this, when done at a loom, is done with a very time-consuming technique of manually picking up threads, twisting them, and then holding them in place with a weft thread. The technique we learned was treadled Leno, which while still fiddly, was much faster and more efficient than the traditional method. I was able to weave a 31 by 17 inch piece in about 3 hours. Our instructor, Becky Ashenden, had come across this method in an old Swedish weaving book, and figured out how to make it work. I won’t try to explain it here—I’m not sure I could! We cannot use this technique on our home looms—we can’t approximate the setup used—but the experience taught me about creative problem-solving! It also gave me a better appreciation for all the handmade lace I see. My lace–all the samples looked the same! 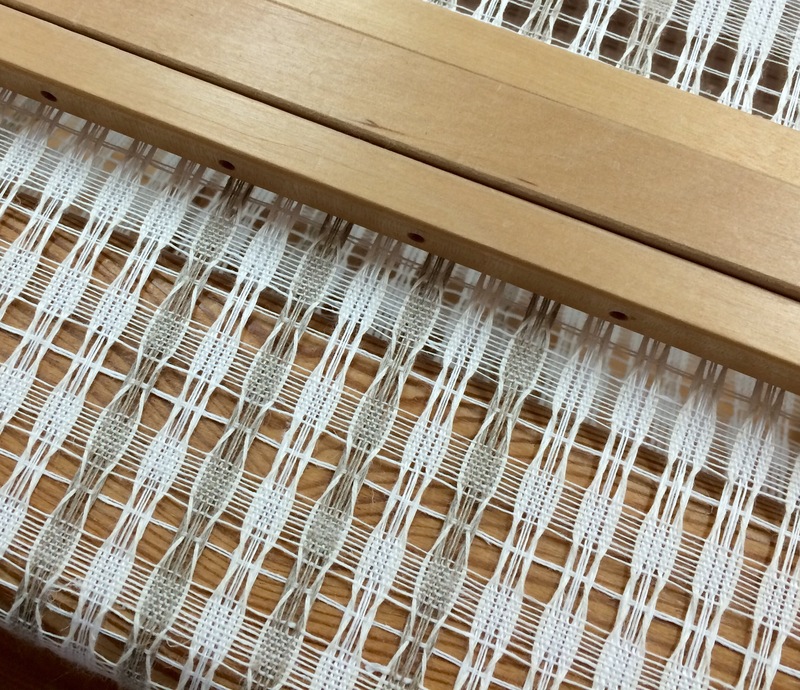 This weaving is done with two shuttles in wool over linen, the way much overshot weaving is done. I found it very scary to try because it looks so complicated but it turned out to be a joy to weave! The setup is not difficult—we can easily do it at home—and there are really only three possible “building blocks” of the design that are combined to create all the different patterns. 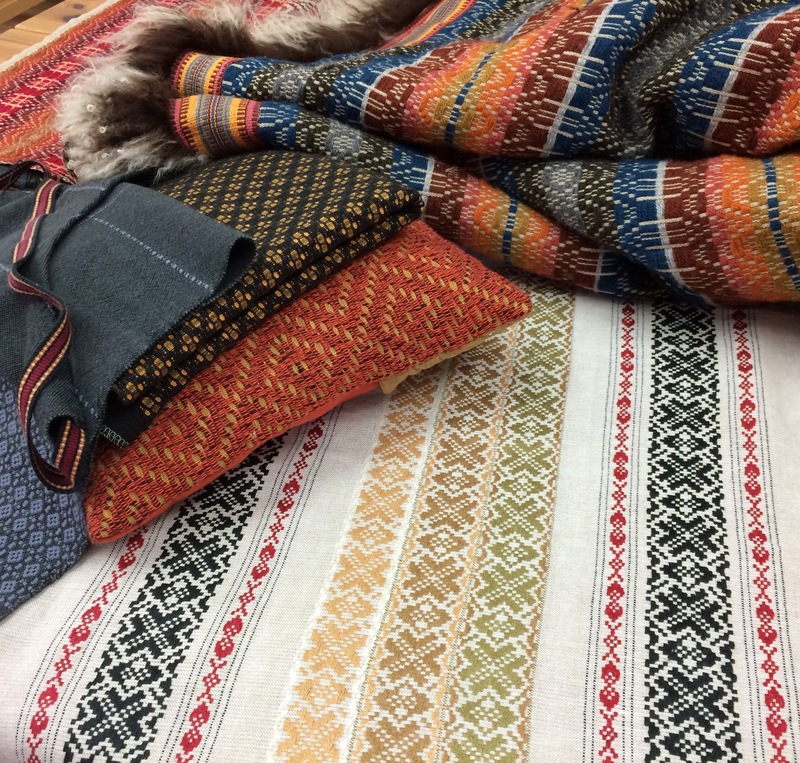 Enkel skillbragd is Norwegian in origin and the weaving was traditionally used as coverlets, lined with sheepskin. I brought home a piece about 24 inches square, perfect for a big sofa pillow. Each with our own–don’t these people look like fun?! Halvdrall seems to mean “poor man’s damask” in Swedish but the structure creates a rich product! This is pretty straightforward to weave, with two shuttles, but looks so impressive! Half of us wove on a warp of varied blues and the other half wove on soft autumn tones. We chose our own weft colors and the outcomes were so different and all gorgeous! 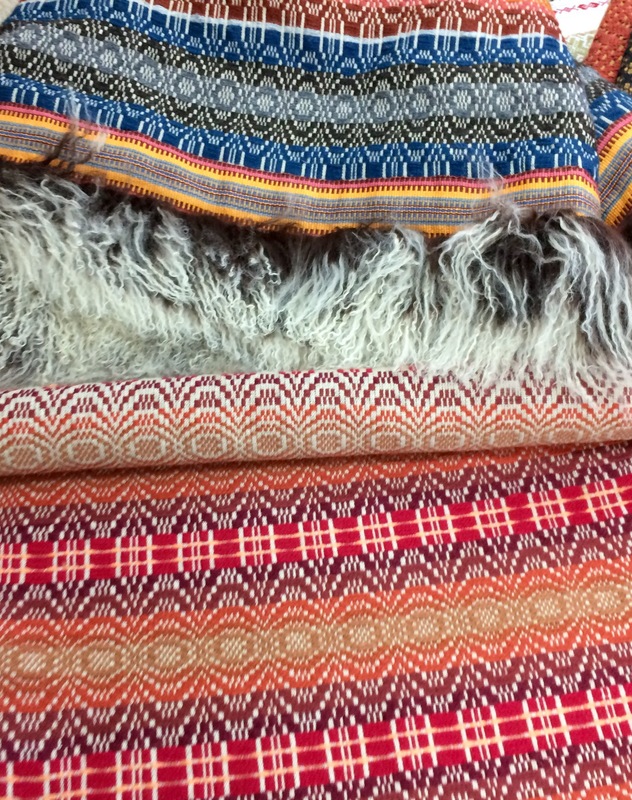 Don and I brought home one of each colorway—they will make nice table squares at about 20 inches. The technique was worked in a cotton and linen blend and would be great in placemats, towels—so many uses! 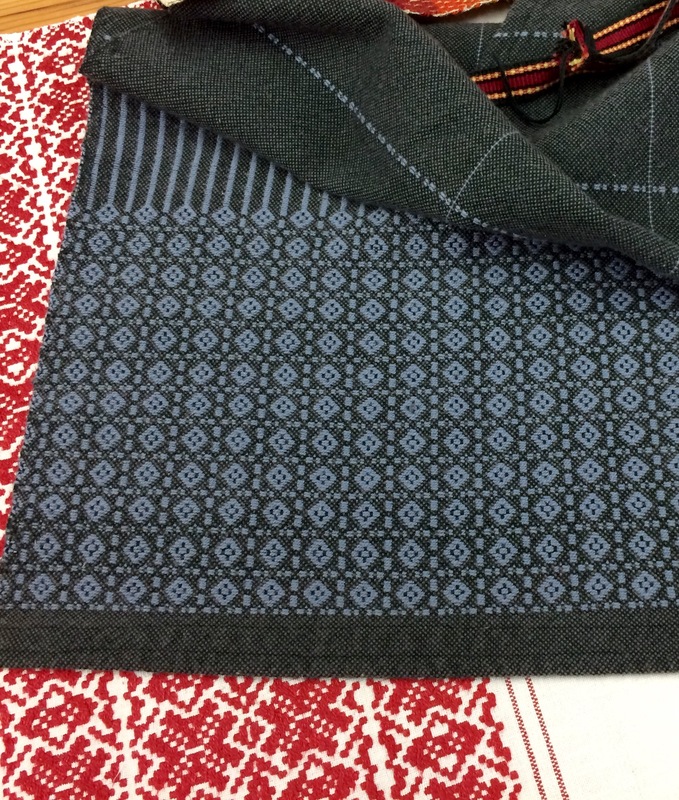 This pretty twill can be done in innumerable designs, as we learned. It’s fairly straightforward to weave but is done on 10 shafts. That’s fine with me—I just acquired a 12-shaft loom! And I love twills! 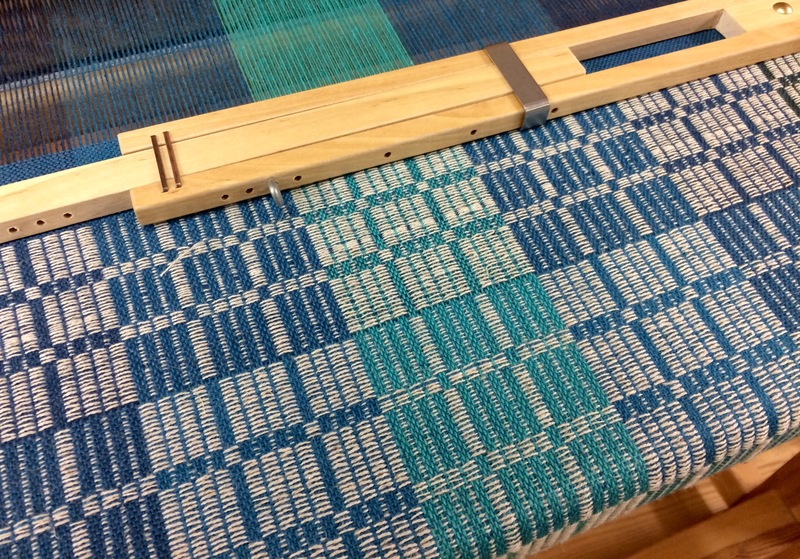 We wove this on a loom that was quite wide and a little finicky. The weaving was accompanied by the sounds of shuttles crashing to the floor and muffled swear words . . .
None of us did very large samples of this—mine is only about 10 inches long. I like it a lot, though, and will find something to make of it. If I only knew how to put in a zipper . . . I thought this looked so difficult but by the time I got to this loom, late in the week, it was like a walk in the park! The fabric, even on the loom under tension, has a neat texture, with those cells of fine thread surrounded by thicker threads. But, once it is washed, it becomes even more 3-dimensional and interesting. It would make wonderful fabric for upholstery or pillows. At 26 by 15 inches, my sample could be a small pillow . . . we’ll see. We made this with fairly fine cotton, what’s know as 16/2 weight. It just so happens that we inherited huge cones of 16/2 cotton with one of the looms we bought so I see honeycomb in my future! I loved opphamta and am sorry to say I can’t do it on my home loom. Or maybe there is a way to do it but only one that would be more fiddly and time-intensive than the way we learned. Opphamta is Finnish and there are all kinds of these designs that look like cross-stitch patterns to me. It’s done with fine linen and the colors and fabric are so crisp and clean . . . My sample is fairly small, 11 by 26 inches, but I WILL find a way to use it at home! Don and I left the studio at 6 every day, exhausted. We covered the same projects over the course of the week but didn’t work on them on the same days so we compared notes and shared advice. We had a quiet meal, a strong drink, and fell into bed. We didn’t stay at Vavstuga’s dormitory this time, which meant we introverts had more quiet time to re-group between intensive weaving sessions. But it also meant we didn’t get to know our classmates quite as well as last time. And they were wonderful classmates—upbeat, passionate (!) about weaving, and all so funny and fun. But, by staying in a B&B, we did get to know an equally wonderful pair of quilters who were in town for an intense and demanding quilting workshop, and loving it. Which brings me back to my original point. These hard, demanding, stretch-yourself-to-the-limits experiences are amazing. To be among like-minded people, to be a little afraid and to overcome that fear and meet success, to share advice and tips in a generous way, to come home re-energized . . . priceless. To encounter a teacher who will give guidance into difficult concepts and just assume you can keep up, who will answer even the nuttiest questions and fix the stickiest mistakes with good humor and good sense . . . all priceless. Priceless, but they come with a price, as do all things we value. These experiences don’t come cheap—they take valuable time and money—but they are so worth the expenditures. We have all been known to spend our money and our time on endeavors worth far less than what can be gained at a workshop designed to make us better at the thing we love to do. Let it be known, I will follow my own advice. I’ll be going back to Vavstuga. I hope you’ll find the opportunity to go somewhere similar, to go away, to dive in, to surround yourself, immerse yourself, indulge yourself in what you love. 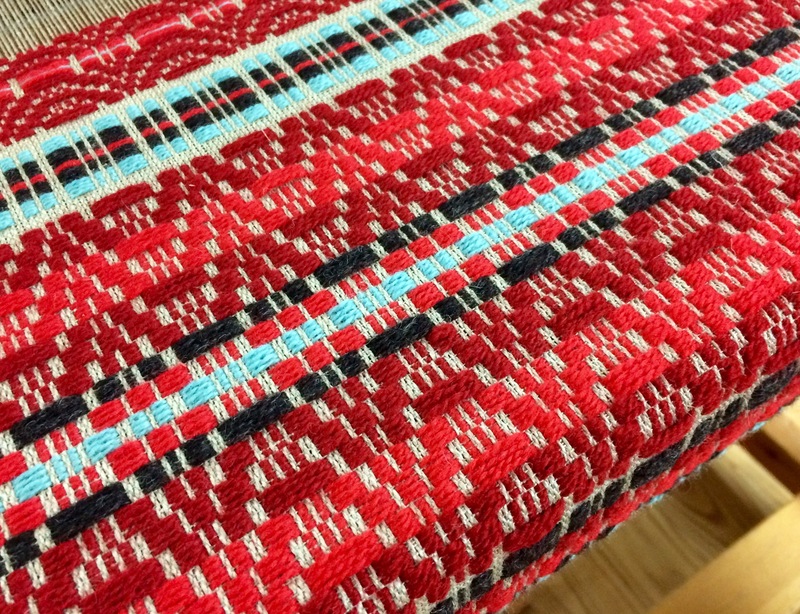 A few photos of our work from this weaving week. I’ll tell you more when I can post from a real computer! 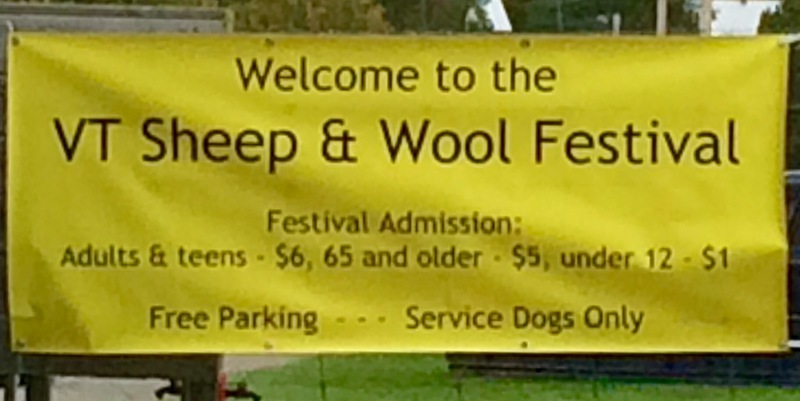 We saw sheep and we saw wool. 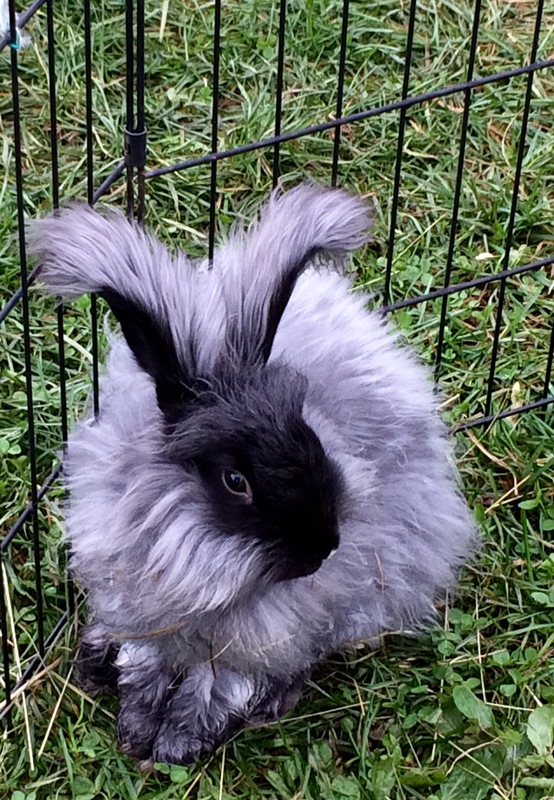 And the world’s cutest angora bunny. 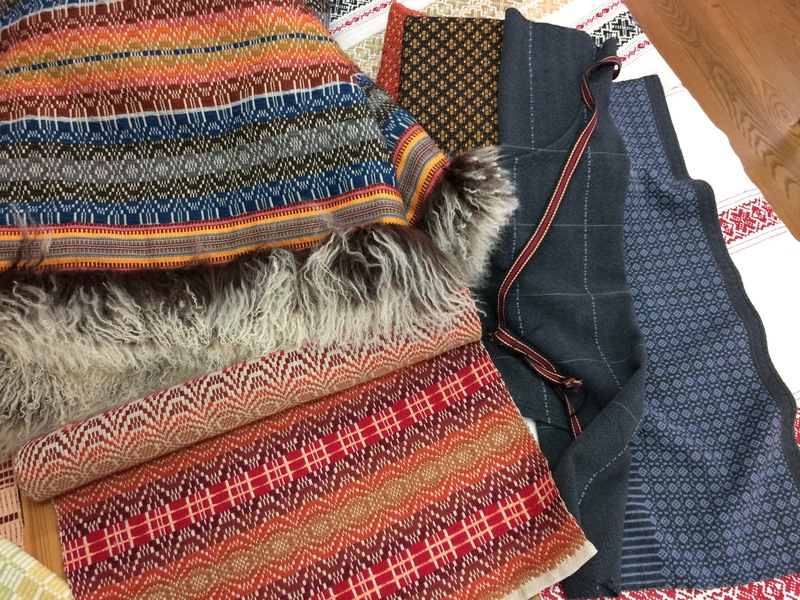 And we had the pleasure of meeting a long-time blog friend, Jennifer, of Heron Pond Designs, selling her beautiful scarves. I hope you’ll stick around! If I can manage this mobile phone version of WordPress, I’ll show you more!